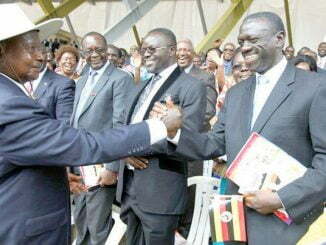 Uganda's President Yoweri Museveni dons a hooded jacket, explaining to motorbike taxi drivers how not to wear them. He was addressing a special session of the Parliament on security on June 20, 2018. 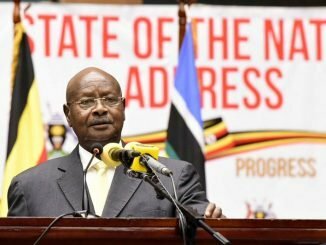 There is uncertainty among traders involved in the sale of hooded jackets and jumpers following a ban on their usage by the president Yoweri Museveni. 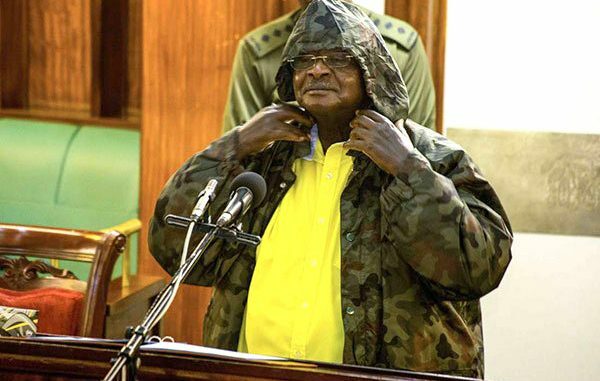 President Museveni banned the use of hooded jackets and jumpers following the brutal murder of Ibrahim Abiriga, the former Arua municipality member of parliament on June 8th, 2018. Two identified men riding on a motorcycle with hoods on their heads gunned down Abiriga and his brother, Saidi Butele Buga, a few meters from the legislator’s home in Kawanda in Wakiso district. Museveni directed police to arrest whoever is found wearing a hood, saying thugs use them to conceal their identity. Several other people including the Principal State Prosecutor, Joan Kagezi, the former Police spokesperson Assistant Inspector General of Police, Andrew Felix Kaweesi and Major Muhammad Kiggundu were killed in a similar manner. The president’s pronouncement on the hooded jackets and jumpers has caused uncertainty among traders. A second cloth vendor in Owino market, who only preferred to identify himself as Moses, says despite selling hooded jackets he isn’t certain whether or not he will be picked up. He wants the president to reconsider his stand on the hooded clothes. Moses also explains that his largest clientele is comprised of late night travelers and boda boda riders who buy hooded jackets to protect themselves against coldness. A female vendor, who declined to identify herself, said banning hooded jackets isn’t the magic shot to the insecurity in the country. Wilberforce Bunani, a boda boda rider, says a traffic officer intercepted him recently for dressing a hooded jacket. According to Bunani, the officer impounded his motorcycle and told him that he would issue him with an express penalty ticket. Bengamin Byamugisha is a Boda Boda rider in Kamwokya, says he has already fallen victim to the president’s directive. According to Byamugisha, a traffic officer recently stopped him on his way to Kawempe because of wearing a hood. Boda Boda riders say they need jackets with hoods to cope with coldness during their work.